ANN ARBOR, Mich. -- The University of Michigan football team may be in the middle of its worst stretch ever. But at least Ann Arbor's golfers can smile. Their two municipal golf courses, led by Leslie Park Golf Course, are shining as bright as ever. 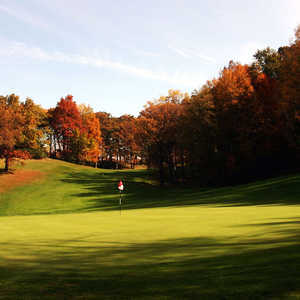 Leslie Park Golf Course's nomination as the top municipal golf course in Michigan for 2009 by Golf Digest capped a run of improvements to a course that withered on the vine for the better part of the decade. After seeing just 28,000 rounds played in 2003, play -- and the course's budget -- slowly declined to rock bottom in 2007, when just 21,000 rounds were booked. As the city looked over the parks budget, the questions were asked whether or not Ann Arbor should even be operating Leslie Park. The city hired a consultant to survey the situation, town meetings were held, golfers were polled, and the response was positive. 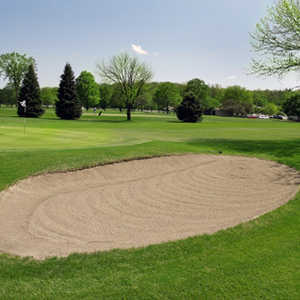 Ann Arbor has some very good private courses such as Radrick Farms Golf Club, Barton Hills Country Club and Polo Fields Golf & Country Club, but for the public, Leslie Park is as good a layout as there is when at its potential. The city determined it would give Leslie Park Golf Course the resources it deserved at long last. All cities are thrifty with the coin these days, so Ann Arbor's parks and recreation department had to pick and choose where to improve. Leslie Park Golf Course's pro shop has little more than a small grill and some shirts and balls, and there's also no driving range. 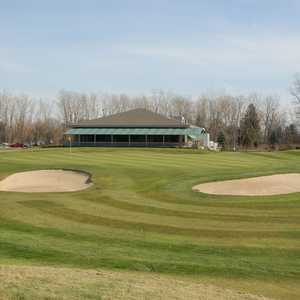 "We're not going to compete with those (upscale) courses," admitted Doug Kelly, who was hired by the city into a new position as director of golf of Leslie Park and Huron Hills Golf Course. "We recognized what we have here, and we have a beautiful golf course." So most of the money was put into the golf course itself. New equipment was purchased to return conditions to optimal shape, including creating an intermediate cut of rough and smooth, consistent greens. "The [maintenance] barn looks like a Toro showroom," Kelly laughed. Customer service was also revisited. Course officials removed the looming Absolutely no golf carts in the parking lot sign, and finally purchased golf carts with rooftops, a necessity for many golfers on hot summer days. Also, a beer and wine license was purchased. On-course bathrooms were installed, and flags now have the red-white-blue location system - which is paramount on Leslie Park Golf Course's large, undulating greens. And long gone is the resident/non-resident green fee difference. When you have the potential to draw in golfers from an area of a few hundred thousand people, it would seem foolish to turn off those without an Ann Arbor zip code by charging them more than the resident group ahead of them. Now, everyone pays the same, while online specials and promotions are offered throughout the season. Local golfers have noticed, and they've returned to Leslie Park Golf Course. In 2009, the course booked 31,000 rounds, a dramatic return to success that took less than three seasons, and Kelly says it's common to book large golf groups from around the state -- and even Toledo -- every week. Are you listening, Coach Rich Rod? It can be done. Located on the city's north side and with a small dirt road separating the front and back nines, Leslie Park Golf Course is full of trees, quiet and hilly. It can be a stiff walk, capped by the climb up "Cardiac Hill" between the 13th and 14th holes (something I'd do every other golf practice in my high school days). It made the 14th hole's tee shot, which slopes right but doglegs left around O.B. even tougher with spaghetti legs. Leslie Park plays under 6,600 yards (four sets of tees total), but the course defends itself with sloping fairways that yield uneven lies and some of the area's toughest greens. Playing the course for the first time in about a decade, I'd forgotten just how imperative it is to leave shots below the hole, starting with the short but severe par-3 second. As a high school player, I always held my breath on holes 4 through 6. They're the holes that are really tough pars, and a bad shot can put you in real trouble. No. 4 is easier these days after the Emerald Ash Borer disease that swept through the Midwest took out a large tree on the right side that could wreak havoc with poorly played lay-ups (trees were also most noticeably removed to the right of the first and 18th holes, which makes these holes far easier off the tee with a righthand bailout). The par-5 11th hole is Leslie Park Golf Course's most dramatic driving hole (and my vote for the signature hole, even if the par-3 17th features a pond and barn next to the tee). Put a perfect drive in the fairway through a chute of trees, and you'll be thinking birdie. Hit a bad drive into jail left of O.B. right, and it's tough to walk off with anything less than a seven. As for the par-4 fifth hole, I've never been able to figure out a consistently successful strategy, and few local players I know have: You're on your own. Leslie Park Golf Course is just north of downtown and the University of Michigan campus, so you can head to some of Ann Arbor's best casual restaurants after golf. Zingerman's Deli in Kerrytown is a must-stop, though if you've ever met someone from Ann Arbor you've already probably heard plenty about it, and suddenly paying $12-15 for a sandwich doesn't seem like a rip-off when it's made with the finest bread, cheeses and meats from all over the world. Pizza House keeps growing and growing, now swallowing up two buildings on Church St. in Michigan's South University district. They specialize in Chicago-style pizza, but I opt for their pizza subs every time, with a Bell's Oberon Ale from the tap. And if you're a burger guy, ditch the fast food chains for Blimpy Burger, where the slices of meat are so thin you should probably get a triple or a quad burger. There's often a line out the door, but the burgers cook fast and you'll make it through in no time. To fuel up before a round of golf in Ann Arbor, grab breakfast at Angelo's, a local institution since the 1950s.